Not belated because I forgot, or anything stupid like that. Belated because I don’t normally post on Sundays. Okay, so maybe it is a stupid reason. But sticking to a schedule helps me avoid slacking off. For the same reason, I work on novels in the afternoon–so I can start at the same time every day, even when I’m working on blog posts in the morning. Bad night’s sleep? Doesn’t matter. Gotta write a blog post. Distracted by something shiny (or ragged and cat-eating)? Tough. Go write some words of fiction. Dad was mildly amused by my schedule adherence, but he understood. “Do what works for you,” is a bit of writing advice that made perfect sense to him. Much as he loved word processing, he absolutely couldn’t edit on a computer. He printed every draft, edited it with a pencil, and then typed his changes in. Which mildly amused me, but again, it worked for him. Last week, I linked a story in the Sedalia Democrat about the Smith-Cotton High School String Orchestra appearing at the Scott Joplin International Ragtime Festival, and promised more words about their appearance. These are those words. The short version, for anyone who finds the Democrat’s website annoyingly hard to use, is that the high school orchestra’s appearance was supported by the Larry Karp Memorial Fund. See, when Dad died, we asked that contributions in his name to be made to the Scott Joplin Ragtime Foundation. We–and the foundation–were amazed and pleased at the number of donations, and we all agreed there was an opportunity to do more than simply add the funds to the foundation’s general budget. I often say that Dad was a storyteller. It’s no accident that he gravitated to baseball and ragtime: both are fields with enough stories to fill every library in the world. Dad liked teaching in the classic sense, but he outright loved teaching by telling stories. He could, and frequently did, talk ragtime for hours*. One of the reasons he enjoyed research was for the stream of new stories it brought him. When he started looking into Brun Campbell–a storyteller himself–the stream turned into something more like the Columbia River. * Baseball, too, but there are more storytellers working that beat than spinning ragtime yarns. Any community needs new blood to live. And Dad worried there might not be enough new ragtimers coming in to keep the music alive. 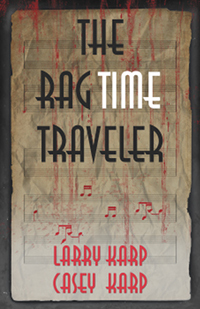 When a new “Ragtime Kid”–a young talent consumed by the need to play ragtime–came along, he was delighted. Using the money donated in his name, not for immediate needs, but to teach the next generation of ragtimers was an easy call. What that’s going to look like is still up in the air. We’ve got some immediate plans, and some ideas for the medium- and long-term, all aimed at getting a new generation interested in ragtime and its stories. But no project succeeds if it never gets started. We threw a whole lot of ideas around for where to start. Bringing the Smith-Cotton students to the festival this year was where we wound up. We got a couple of dozen students and their families to the festival. That’s a win no matter how you look at it. If only one of those dozens sticks with ragtime, whether as a performer, researcher, or listener, then it’s a major victory. I mentioned last week that the festival was somewhat smaller this year than in the past. Money’s tight all over, but especially so for art programs. We’d love some help. If you’re willing to lend a hand, please drop a note to sjfsedalia@gmail.com. Thanks from Dad, from the whole family, and from the entire ragtime community. This entry was posted in Music and tagged Larry Karp, Larry Karp Memorial Fund, ragtime, Scott Joplin Ragtime Festival. Bookmark the permalink. I’d thank you, Casey, but thanks aren’t appropriate. On Father’s Day, my brother (your father) and his quirky, wonderful family were in my thoughts. Goddess speed to the fund. Every birthday, there’ll be a donation. Well, I can certainly thank you. Thank you. For keeping ragtime alive. And for keeping Dad’s stories going. Again, Casey, thanks aren’t needed here. Still choked up from your blogpost.